The Isle of Goats just off the coast of Brittany in France is home to the wonderful Gavrinis megalithic cairn. The cairn is about 5500 years old, it is 60 metres in diameter and covers a passage and chamber which is lined with elaborately engraved stones. The 12 metre passage leads to a 2.7 x 2.3 metre chamber which is covered by a large granite capstone. 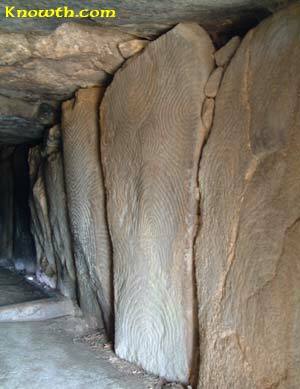 Gavrinis is remarkably similar to Newgrange which was built about 300 years later. 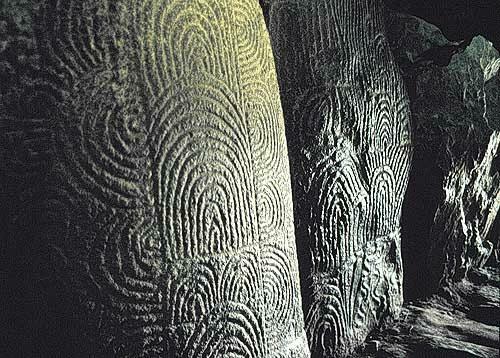 There must have been close contact between the Neolithic people of Ireland and Brittany which are 400km apart. Gavrinis (Gavr'inis) is a 10 minute boat trip from the harbour at Larmor Baden, the round trip including the guided tour lasts about 1 hour and 20 minutes. In order to protect the monument and avoid scratching the stones, cameras are not allowing inside the cairn. 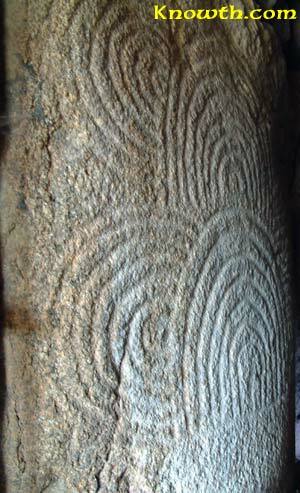 In the passage and chamber 23 of the 29 upright stones are elaborately engraved with zig-zags, concentric circles, herring bones, axes, bows and arrows. Julian Cope in his book The Megalithic European comments "A pavement lined the floor of this passage and chamber, the entrance to the latter being defined by a carved sillstone reminiscent of those beautiful carved lintels seen at Ireland's Fourknocks and at the Bend in the Boyne"
Aubrey Burl in his book Megalithic Brittany comments "It is for its art that Gavrinis is famous. No fewer than twenty-three of it's twenty-nine upright stones have been carved, not in single or isolated motifs but in a profuse series of compositions so that stone flows into stone or is mirrored by another in patterns engraved in low relief. The art is balanced in panels horizontally and vertically in symbols of which the main elements are concentric arcs and axes. These latter implements have splayed cutting edges like the big, prestige axes from the Carnac Mounds." 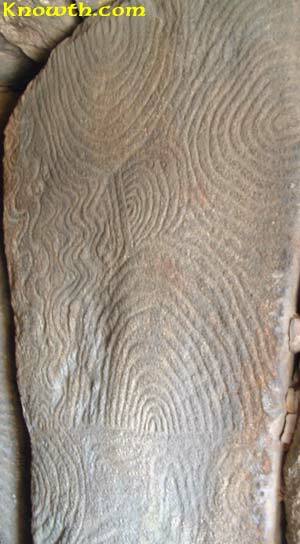 Upright stone no.18 (not shown here) has 3 horizontal hand sized holes about 10 cm deep similar to kerbstone 52 at Newgrange. The passage and chamber at Newgrange are clearly aligned to the rising sun at the Winter Solstice, Gavrinis is aligned in the same direction but the chamber is not illuminated like Newgrange at the Winter Solstice. Perhaps the ancient Irish were better engineers than the ancient Bretons. Aubrey Burl comments "Looking from Stone 19, at the left-hand entrance to the chamber, towards Stone 1, the bearing is 128°, almost perfectly in line with the midwinter sunrise. The main axis of the passage is 134° towards the low-lying Arzon peninsula and the orientation is close to that of the major southern moonrise. It has been calculated that the two alignments, one solar, the other lunar, intersect halfway down the passage level with Stone 7, the white quartz slab whose undecorated surface may have been illuminated by the light of the rising sun and moon." Megaliths of Morbihan - Carnac, Gavrinis, Locmariaquer and the Petit-Mont.